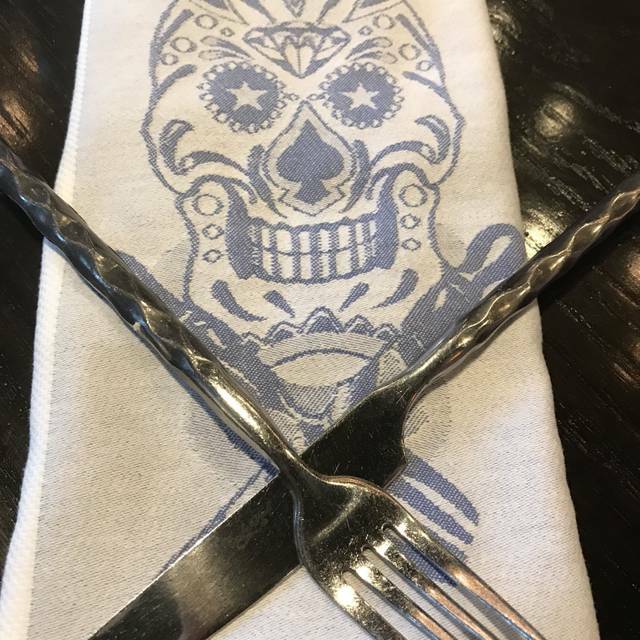 You must make reservations at least 5 minutes in advance of the time at Guy Fieri's Baltimore Kitchen & Bar. Free Trivia Night ever Wednesday from 7pm - 9pm with extended happy hour specials, free slot play giveaways, and more! Wednesdays @ 7 pm: Join us for Trivia Night hosted by Charm City Trivia. Win prizes, such as free slot play and dining vouchers while enjoying extended Half Price Happy Hour. As a reminder, every guest must be 21 or over to dine with us. Last Tuesday of Every Month @ 7 pm: Join us for Brews with Bites where we team up with a local craft brewery and pair four beers with four delectable courses. At $45 per person, it's a steal. Call the restaurant today to reserve your spot as space is limited. 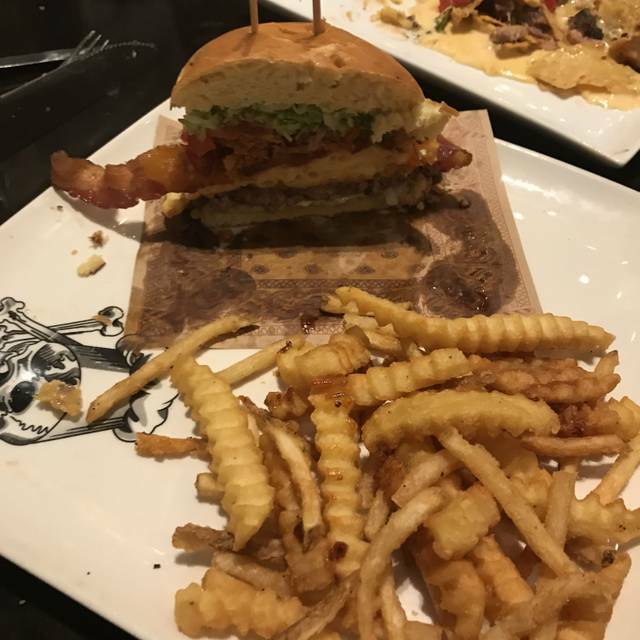 Guy Fieri's Baltimore Kitchen and Bar is located inside the beautiful Horseshoe Casino on the first floor. All guests must be 21 or over to dine in the restaurant. 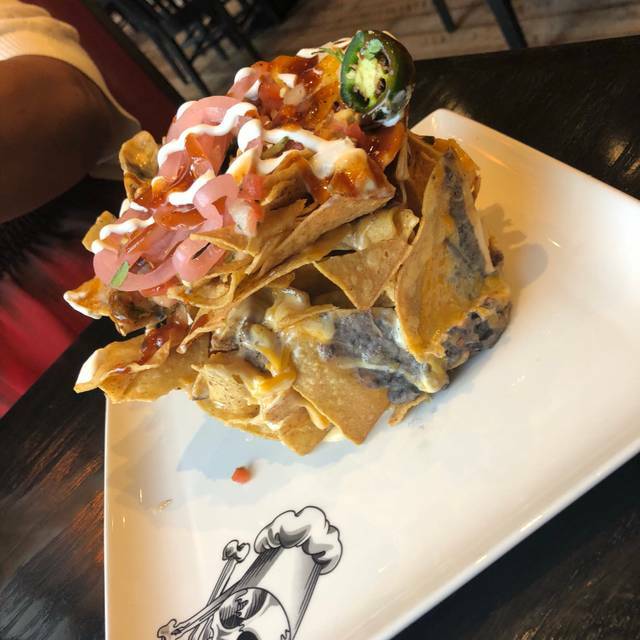 This fun loving restaurant offers guests a taste of Fieri’s signature cuisine, featuring huge, bold flavors and unique twists on traditional dishes. Open daily for lunch, dinner and late-night dining this restaurant offers a delicious blend of casual foods, including an extensive variety of burgers, wings, small bites and shareable food items. Guy’s also offers a diverse beverage selection including a California influenced wine list, a creative collection of signature cocktails, nitrogen frozen shots and craft beers. deep eddy sweet tea vodka, rock candy syrup, peach syrup, fresh lemon juice. jose cuervo gold tequila, cointreau, homemade margarita mix, grand marnier float. cruzan rum, fresh mint, fresh lime juice, rock candy syrup, topped with ginger beer. fireball cinnamon whisky, fresh lemon juice, apple + cherry juices, dash of chipotle. wild turkey bourbon, lemon, cayenne pepper, maple syrup. cruzan guava rum, guava purée, orgeat syrup, fresh lemon juice, topped with apple ale. ketel one citroen vodka, st-germain liqueur, fresh rosemary, fresh lemon sour, rock candy syrup, sugar rim. maker's mark bourbon, orange bitters, fresh lemon sour, rock candy syrup, amaretto. ask your tour guide for details. a huge mountain of cheesecake topped with potato chips, pretzels + hot fudge. honey graham ice cream, brioche, graham cracker butter, marshmallow and chocolate with chocolate + raspberry dipping sauces. mint chocolate chip ice cream pie with oreo cookie crust + hot fudge. a build-your-own sundae brouhaha wrapped in phyllo dough and breaded with frosted flakes. The service was extremely slow, but everyone was very nice. Food was good. The food was okay and for the price, not worth it. I really was excited to eat hear, and found it just okay. 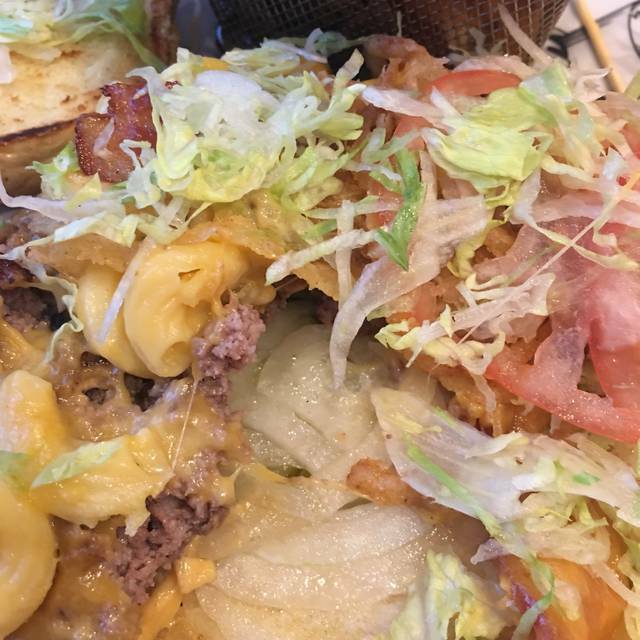 We started with the loaded fries, they were not loaded. They put everything on the side. I had the veggie burger, which tasted like the one I get at any restaurant. Nothing special at all. My husband had the ribs. They came out warm, not hot. My daughter had the salmon and it was dry and our friend had the burger which was good for a burger. Not impressed and will not be back. This was the worst experience I have ever had at a restaurant. Appetizers took 45 minutes to get out, once it did come out the brisket on the nachos tasted terrible and had a rubbery texture. Wings were still frozen. Our server replaced our wings, and brought our meal out shortly after. We had to tell the manager we couldn’t eat anything and she took our food off and only charged us for our drinks and nachos. Everything was disgusting!!! Nothing on the website told us that people under 21 could not enter bcz entrance was inside the casino. We were from out of town with our 16 yr old daughter and her friends and were extremely disappointed to get there only to find out we were denied entry! We went there to celebrate a birthday. We shared the Ribs and cheesecake for dessert. They were really good. But there were a lot of gristle. The sauce was amazing! We will be back! Mac and cheese was excellent but brisket was dry and not very tender. Our “adult “ family went to Guy’s to celebrate a birthday. I was told by a friend that the food was horrible...... wrong. The burgers, Amazing!!!! I would definitely recommend. Thanks for making my brother in laws bday special. The atmosphere was great. Our server Jazmin was so friendly and helpful. She did an awesome job and was very attentive to us. The food was freaking amazing. The night before I had the crab cake sandwich and the next day I went back and ordered the Baltimore Cheesesteak sandwich. Then late last night about 1:00 some friends and I went there after a late concert and I ordered the bourbon bbq wings. It was outstanding! Noise level was just a little too loud for the noon lunch hour but overall if I’m ever in Baltimore again this will be the place that I go to. The wait time is horrible, been there twice and it has been same excuse, employees called out, expected to get menu that is online, nope got some game day menu, manager excuse, not enough kitchen staff to accommodate regular menu. Very upset with this location, better experience in his Vegas location. 1/31/19: I used my final 100 in Annual Celebration Dinner. 1) I regretted I could not use my Annual Celebration Dinner for the 55 and over Thursday lunch between 11a.m. and 4p.m. 2) It would be helpful if the vegetable menu had more of a variety (broccoli, carrots,). 2a) There is only one green vegetable other than romaine lettuce and that is asparagus. 3) The pepper shaker needs more holes. I enjoy pepper; but I was shaking for about a minute to get enough. Lastly, 4) I had to order everything at once, even take out meals. And the take out meals were brought to the table at the same time as my eat-in entree. This necessitated me packing up take home food while my entree was getting cold. 1/30/19: Again, I used my Annual Celebration Dinner. There are inconsistent rules on how the celebration dinner can be spent. 1) All my three occastion dinners were spent in January at Guy Fieri. 2) The first time I could add mixed drinks. 3) The second time I could not. 4) Since we do not use the Kiosk anymore, the first time the host simply took the exact meal amount from my dinners ($145.00). The $55 was then left on my celebration dinner balance. 5) The second and third time, I had to take off the dinners in increments of $100. In Summary, 6) So, when I came back thinking I could order a wine, or stronger drink. I could not. I had to rethink my meal choices which made for disappointment. Ordinarily I would recommend to everyone; however, this last experience was not pleasant. Reservations was at 6:30 approximately three tables was filled at the restaurant and our food still did not arrive until 7:45. Two of the meatloaf meals was extremely spicy with one tablespoon of thick gravy on top. The brisket was dry as leather on another meal and the potatoes ice cold on the fourth meal. My server knew my complaint and asked if I wanted to speak with the manager, I said no because I was speechless and couldn't believe what I was experiencing. I usually dine at this restaurant whether I'm alone or with a group and the food is very tasteful so I'm going to take this as the restaurant (cook) was having a bad day. Glad you asked. Ordered steak, husband ordered a salad and salmon. They brought out the salad & steak at the same time. Since when is salad & entree brought out at same time? I asked for bread, but was told it would be an extra charge. Who charges extra for bread in a restaurant. So I had to sit and watch my husband eat because by the time they brought his salmon, I had finished the steak. It was served with garlic mashed potatoes & asparagus. The potatoes were ok, the asparagus was limp and flavorless. I brought the steak that I didn't eat home because it was like I'd requested. So after my husband finished eating we requested our dessert to go & were told that they did't do "to go." This after a card on the table advertises a meal "to go." So they brought dessert & boxes. I ordered the Dark Chocolate Whiskey Cake. I'd seen them bringing out to others, so I thought I'd give it a try. But when I received the cake it was a fraction of the size served to others. So I asked if they were running out of the cake because I felt cheated that I'd received such a small size. The waitress returned w/another slice so when the two pieces were put together, the size was still not the same as what others had received. So I boxed it-it would've been so much easier for the restaurant to have done this. It's had to do with a spoon! And they didn't even include the whipped cream that was advertised. I still can't get over charging extra for bread. This was not my first time at this restaurant, but it certainly was probably my last. Would give zero stars if I was able to. We did not get a chance to eat here, we left due to poor service. We had a reservation and 40 minutes passed our reservation time we were still waiting to be seated. There were many other people waiting , well passed their reservation times as well. The hostesses kept disappearing and would reappear and be busing tables. There were numerous empty tables that needed cleared or were ready for people to sit at, but no one was being seated at them. Could hear many people asking when their food would arrive. Plus also witnessed several people attempting to speak to their waitress, but the waitress would ignore them. The service as not great and our waitress was really slow getting our food. Great food, not so great service! We were asked half way through the meal if we still wanted our appetizer, which came out right before the check. Maybe it was just an off night. Our Appetizers were excellent. We had the Chicken Wings, and 2 orders of the Mini-Bison Burger's plus drinks. Since it was early, we sat in the Bar Area. The hostess seating us was not very friendly but our waitress had a nice smile with a big welcome to Guy's Restaurant. We will return again. Thanks. Worked out perfect for eating before the Ravens game. Just a short walk from the light rail drop off on Hamburg Street. We made a reservation, but it was near empty when we walked in. Waitstaff was very attentive. Food continues to decline. Service is non existent. A few years ago this place was very good. Food was excellent, Server Jasmine excellent. 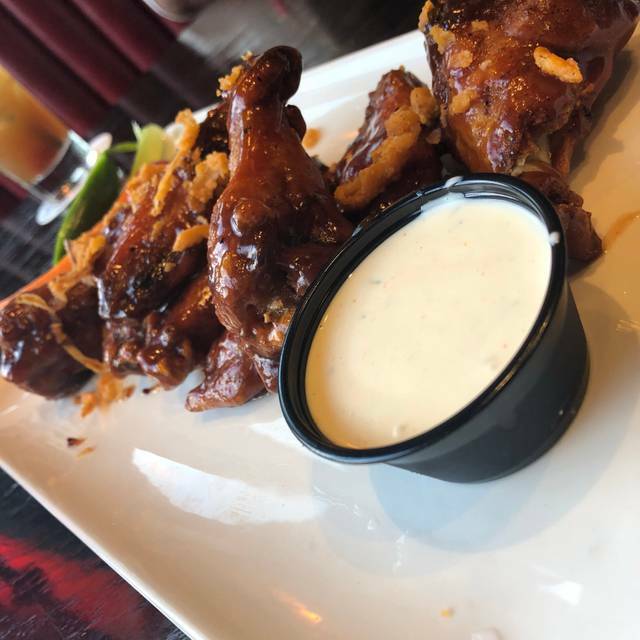 Game day specials are perfect. Food was very good, trash can Nacho appetizer was a delightful surprise. The service was horrible, with friendly but terribly slow service. Waited one hour to get our food. Their only explaination was that the kitchen was backed up. I made a reservation so that I could send a message regarding a credit card that I left at the restaurant after I left two voice mail messages to call me back to see if the card was lost. I have received no response. This is not the way to treat customers. Even though the food was excellent I nobody bothered to care enough to call me back regarding my lost credit card. On a gameday the menu is limited. The food is above average but the service suffers during peak times. great food. Partner loved the Mac and Cheeseburger I loved the pulled pork on the pretzel bun. Service was so SLOW though. Drinks - did not like the specialty drink of the crush - could not taste the red bull, or the orange soda just more like a Vodka and OJ. Well done! Pure Guy! Loved it. Both of our steaks were way over cooked. Sent mine back and it came out over cooked again. The. The waitress told me the chefs don’t know how to cook a steak and this always happens!!! Rotisserie chicken was on the dry side. Turkey burger was good with the tri- fries. Only 2 selections for wine, house red or house white. Prefer the Vegas restaurant much more. We were a party of 4 and everyone enjoyed their food. I had the crab cake and it was very good! I also had a "lemon drop not" and it was soooo yummy! Service could of been better. It wasn't bad but the service was just flat and lacked personality. Just a simple smile goes a long way and the staff didn't seem to be very happy. Was expecting a good food experience at a food celebrity’s restaurant, but surprised and disappointed at the poor quality of the rib platter and entree salads that we ordered. Good waitstaff almost salvaged the meal. I ordered the Creole Shrimp Boil. My potatoes were raw. My shrimp were definitely not boiled; rather, they appeared sauteed and overdone. The menu described a half-pound of shrimp. I received about 8 shrimp and the entire dish was sitting in a pool of oil, which was flavorful but just too much. 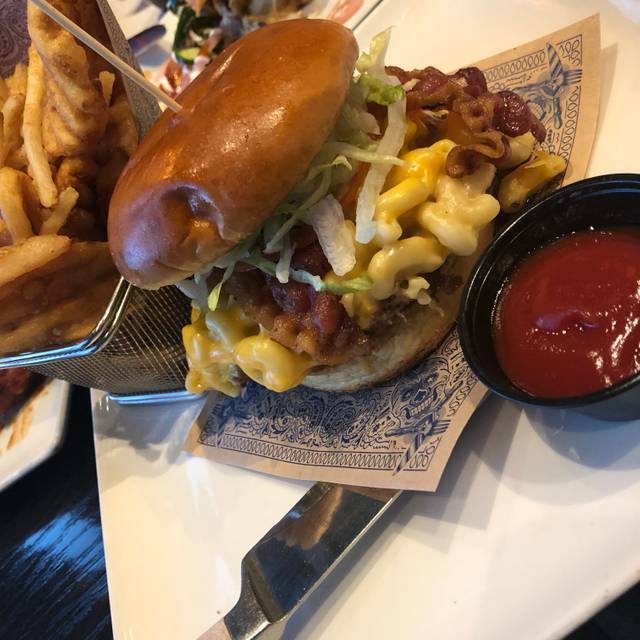 My boyfriend ordered the Mac & Cheese burger. The bottom bun was so soggy that it was inedible, and the bacon was under cooked. Disappointing overall. We were so hungry, we didn't want to bother sending the food back. The food was good, but the service was poor. Took forever to place our order and the staff were rude and inattentive. Took 15 minutes to get waited on. Food was sub par. Waitress was snooty. I hope they didn’t spit on our food. Another loser from Open Table. Food was great and got to me quick. Service was not their at all as I never saw the person again UNTIL it was time to pay. I've been to Guy's twice and both times I was unimpressed. The first time we made a reservation for 7 pm and didn't get seated until 10 pm. Then we were told that the menu was limited due to the late hour. The food wasn't great, mostly because I couldn't order what I wanted. The second visit, we were seated on time but had to wait for 20 mins to be attended to. Our food came out piecemeal, but it was decent. Not sure if I will go back again. Went for my husband birthday. Been to the 2 in Atlantic City and the one in Philadelphia. This one was disappointing. We love guys but this one was lacking in service. We ate at 5 it was empty and the waitress disappeared during dinner. They didn’t have the potatoes for the meal my husband got and when she apologized she blamed it on the kitchen. Then our meals come out with our appetizer. It was so frustrating. Like I said we really love the other ones. Reserved for Father's Day. 7 pm. Arrived to a nearly empty restaurant. Maybe 2 tables occupied. Stood awaiting hostess to ck in. Finally someone appears and says someone else will be right back to ck us in. Continued to stand and wait. Saw several employees just shooting the breeze chatting. They saw us standing and waiting. No effort to welcome or seat us. Finally I walked over to an employee and said we would go elsewhere since their service was horrible. No wonder the restaurant was nearly empty on a weekend night. Went to another restaurant in the Horseshoe Casino. It was very busy, but we were instantly greeted and seated. If Guy Fieri makes it in this Baltimore casino, it will be shocking. Horrible service. Employees outnumbered the customers. Less than total of 10 customers. Poor service certainly explains lack of customers. The restaurant is in a casino. Would be nice to know that as everything thats wrong with it is part of that experience. Very few food choices, two wines (no exaggeration) and watered down cocktails was just part of the problem. We got our food relatively quickly but the drinks took forever and the place practically empty. They had major problems splitting checks and we were a large party. Not for anyone. Didn’t realize this was in the casino but needed lunch and parking was free and easy. Service a little slow but the salmon was good.